Honored to share that I've been invited to curate an art exhibit for The Amadlozi Gallery - located at African Heritage Cultural Center. 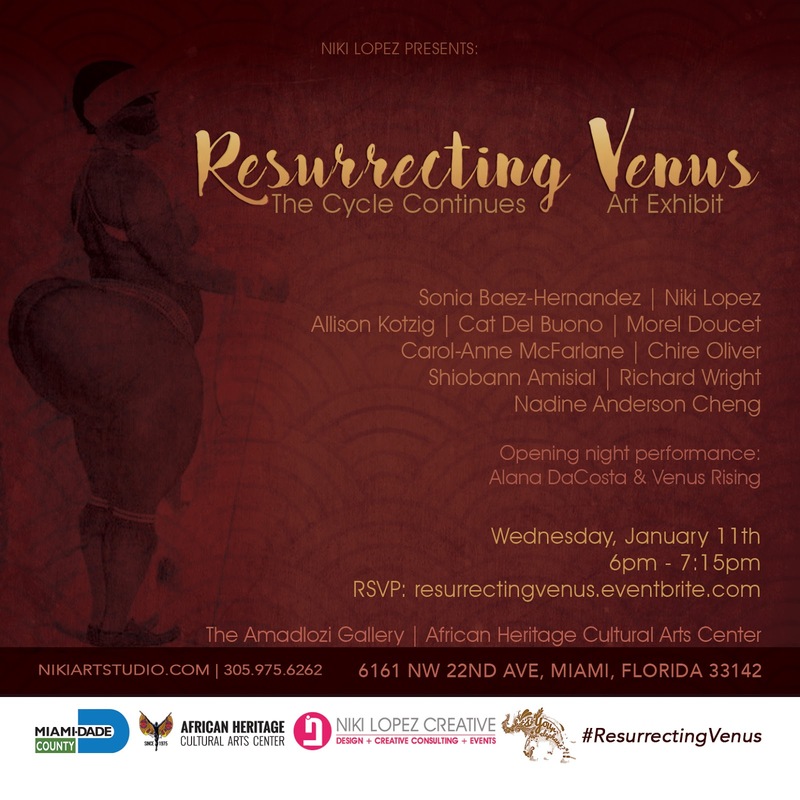 The Amadlozi Gallery at the African Heritage Cultural Arts Center and The Miami-Dade County Department of Cultural Affairs proudly presents Resurrecting Venus: The Cycle Continues curated by Niki Lopez. The group art exhibition 'Resurrecting Venus: The Cycle Continues' addresses the oppression and exploitation of women throughout history & in modern times. This exhibition is being produced in collaboration with the play "Venus" by Suzan-Lori Parks, an avant garde telling of the story of Saartjie Baartman, which opens at 7:30 the same night in the Wendell A. Narcisse Performing Arts Theatre adjacent to the gallery. Visual artists: Sonia Baez-Hernandez, Niki Lopez, Allison Kotzig, Cat Del Buono, Morel Doucet, Carol-Anne McFarlane, Chire Oliver, Shiobann Amisial, Richard Wright and Nadine Anderson Cheng. Performance: Alana DaCosta and (members of) Venus Rising: Women's Drum & Dance Ensemble. About the Curator: Niki Lopez is an interdisciplinary artist, curator & activist. She is also the Founder of What’s Your Elephant a movement using the arts to create provocative conversations around the unspoken. The Amadlozi Gallery is in The African Heritage Cultural Arts Center, the nucleus of arts learning, training and access for Miami-Dade County’s African-American community. The gallery is open by appointment in addition to the Opening & Closing receptions.